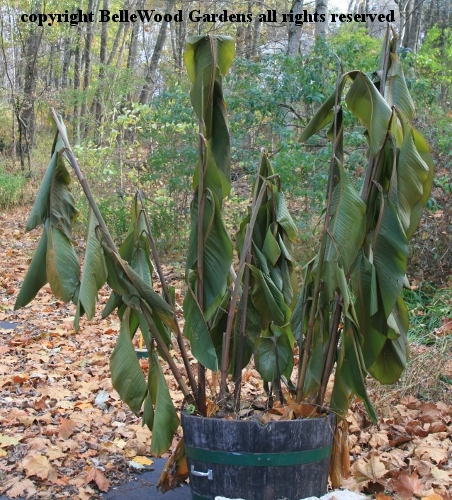 Canna musaefolia, the banana leaved canna. Enough of a frost last night to nip back tender canna leaves. 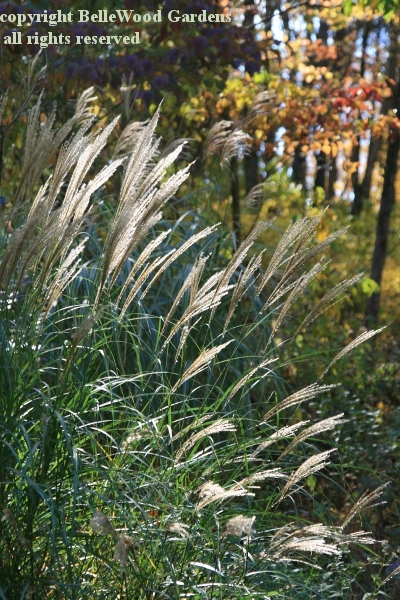 of maiden grass, Miscanthus sinensis. 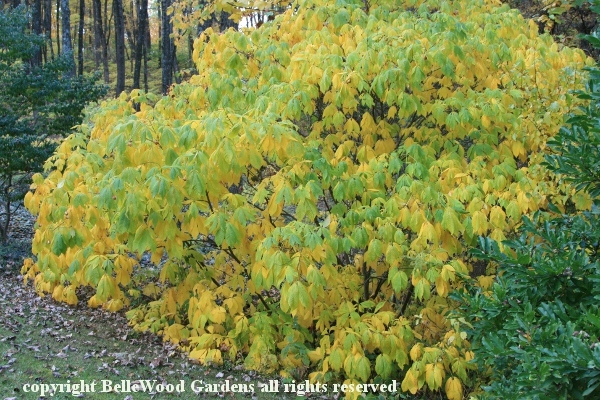 This is another shrub that arrived at BelleWood Gardens in a wardrobe carton when we moved from Connecticut lo these many years ago. 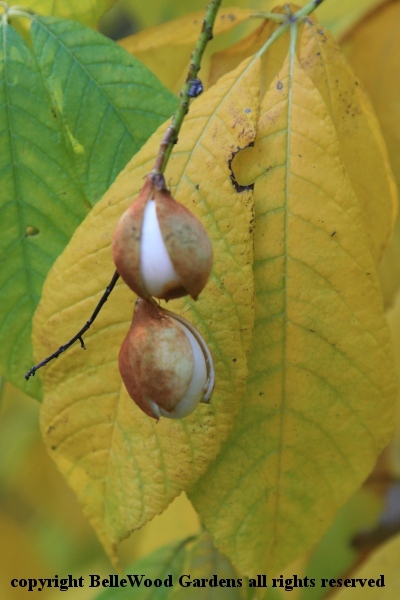 I raised this bottlebrush buckeye, Aesculus parviflora, from seed. considering how it suckers I don't see the need. 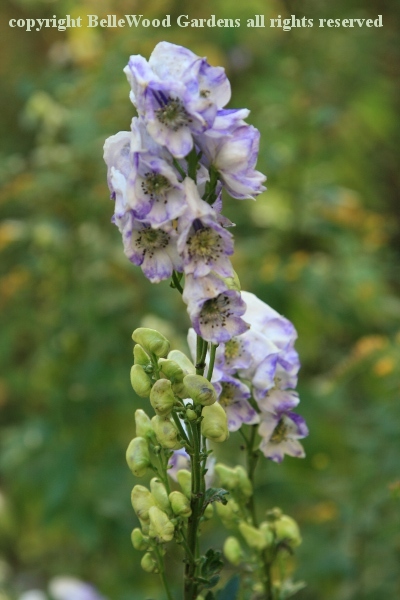 I do enjoy the autumn flowers of monkshood, Aconitum carmichaelii. to the hood of a capuchin monk's robe. is also attractive in a more subdued manner. The drought continues. 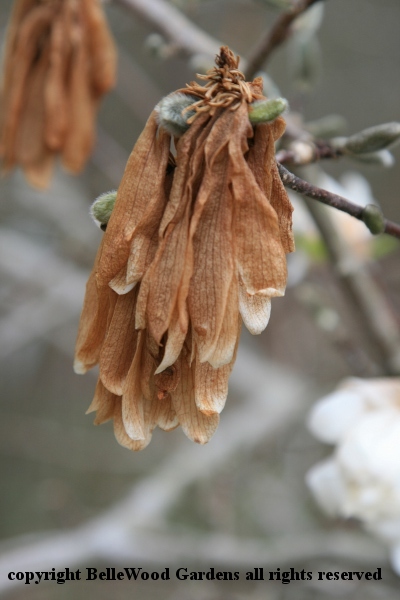 Even established shrubs are suffering. It has been very dry. 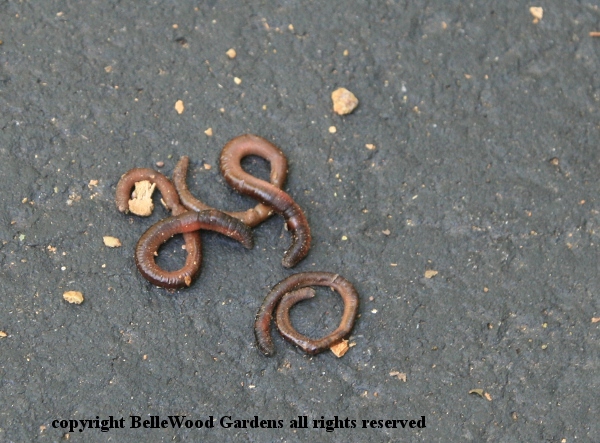 At night earthworms crawl onto the driveway looking for moisture. Then, come morning, they dehydrate even more. And die. 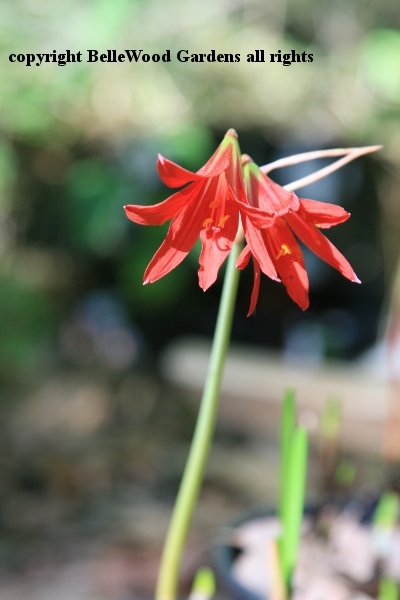 Oxblood lily, Rhodophiala bifida is native to Chile. German settles brought it to Texas, where it thrives. 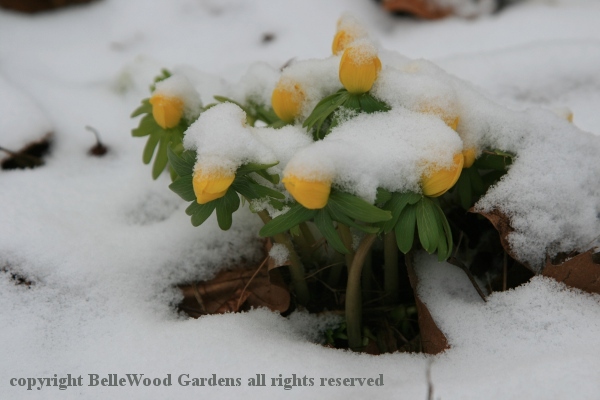 At BelleWood Gardens it winters in the greenhouse. 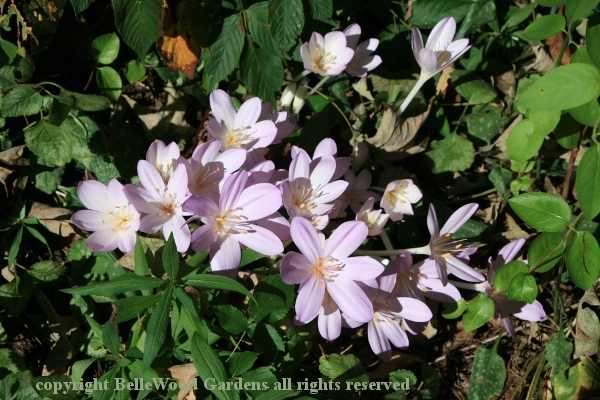 Autumn comes with the flowering of Colchicum autumnale. 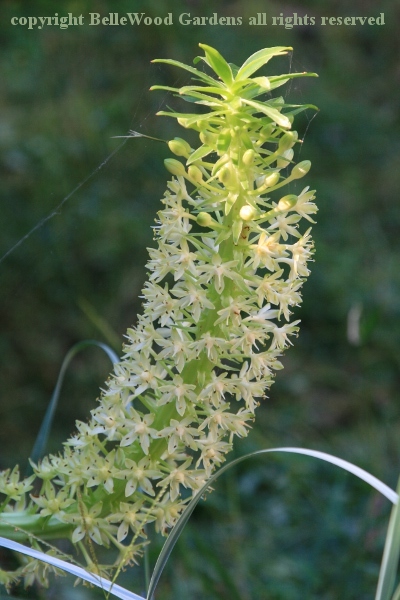 My giant pineapple lily, Eucomis pole-evansii. 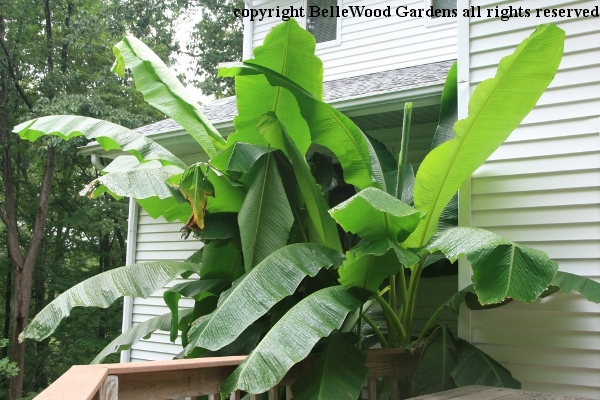 My bananas in the rain. 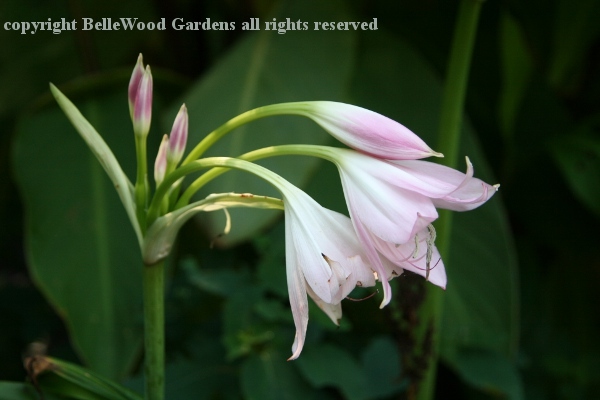 When my crinum come into bloom I forgive and forget all about the nuisance the very large bulbs in their very large pots create in winter when they move into the greenhouse. It's the vegetable vampire, dodder. Looks like a tangle of orange string but in reality it has little hastoria that pierce the cell walls of their host plant, sucking up nutrients. 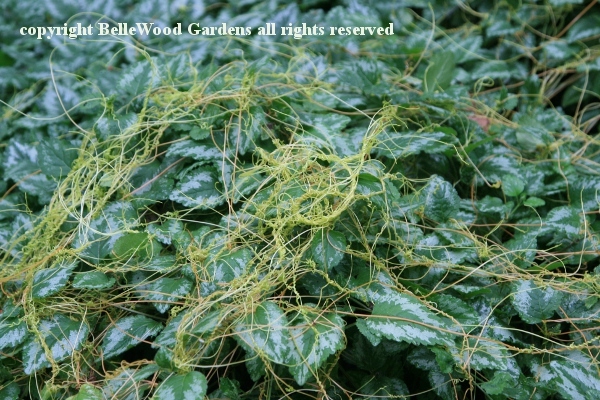 Cuscuta is a real plant. Not a saprophyte that lives on decaying matter, not a fungus. 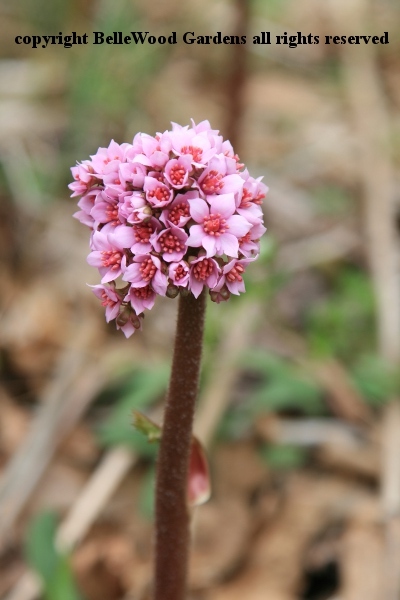 Has flowers, makes seed, sprouts like any normal plant. Attaches to a host and the roots wither away. 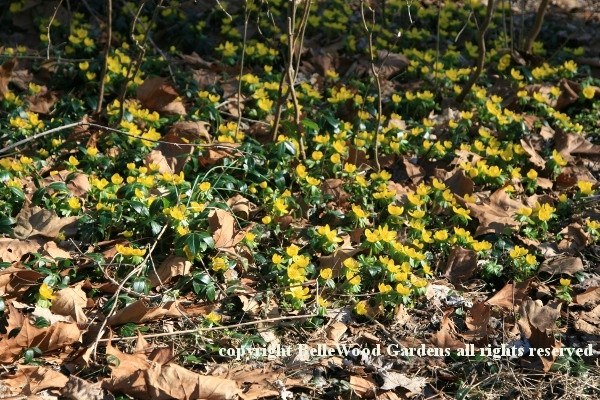 I have a patch that yearly attacks some yellow dead nettle, Lamium galeodolon. I rip it out, bag it up, and hide host and vampire in the trash. Comes back, every year. So this year I went to war. 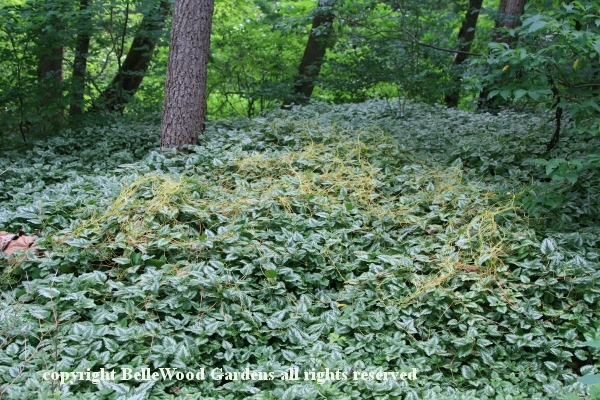 Since I don't care about the dead nettle I sprayed it with an herbicide, wherever I saw dodder. It killed the dead nettle. And the dodder has not reappeared. Will report back to you next year. 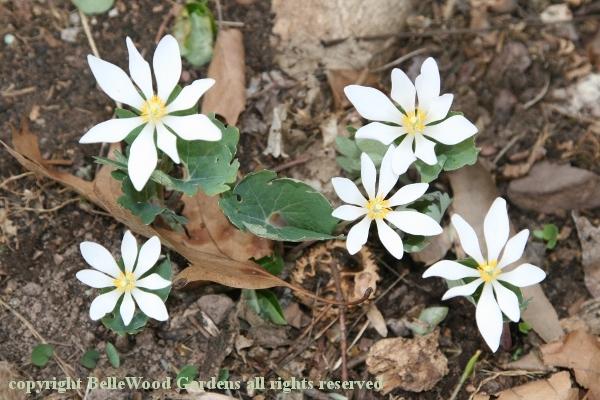 outdoors in a half-barrel size container. 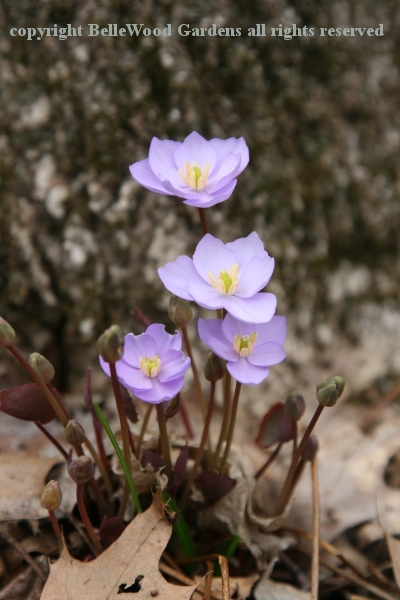 They spend the winter dry and dormant in the basement, then waken with the Spring. and this beauty with a faded label. Along with the others, enjoying their summer vacation out of doors. 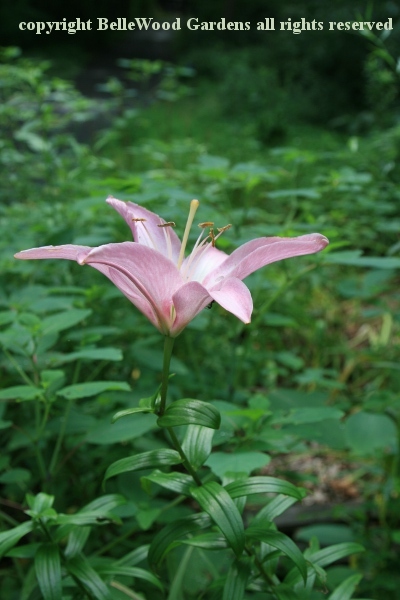 Not sure of the cultivar name for this daylily. 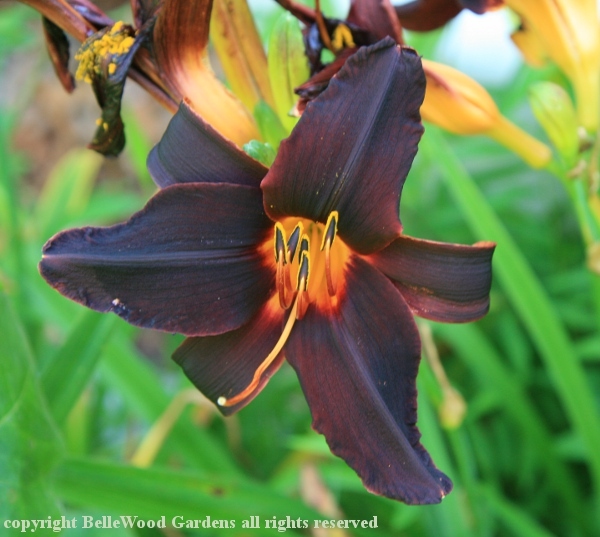 Lurking in the corners of my mind is Hemerocallis 'Heart of Africa' but cannot find it on line. Anyone have a suggestion? 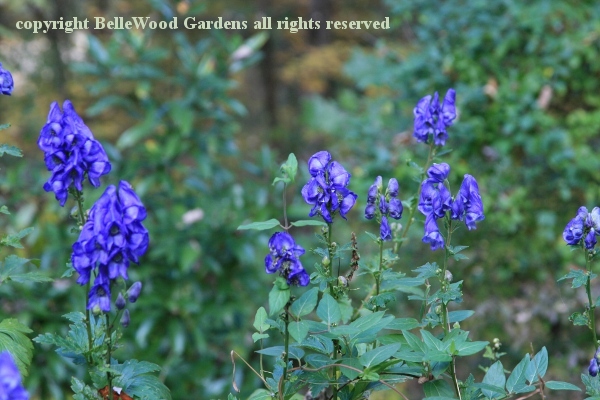 A very helpful reader of BelleWood Gardens site - from Germany, no less! - has supplied an answer. It is 'Africa'. My thanks, Jan, your help is much appreciated. 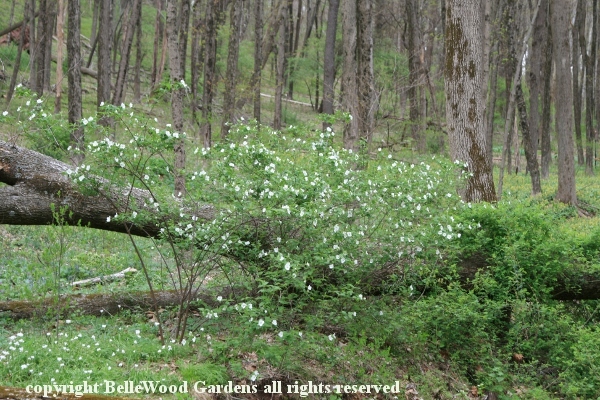 it's the handsome foliage that gives Syneilesis aconitifolia a home in the woods. 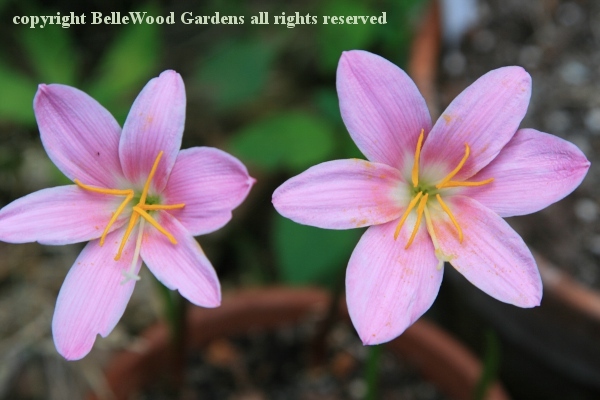 Rain lily, fairy lily, Argentine rain lily - all are names for Habranthus robustus. 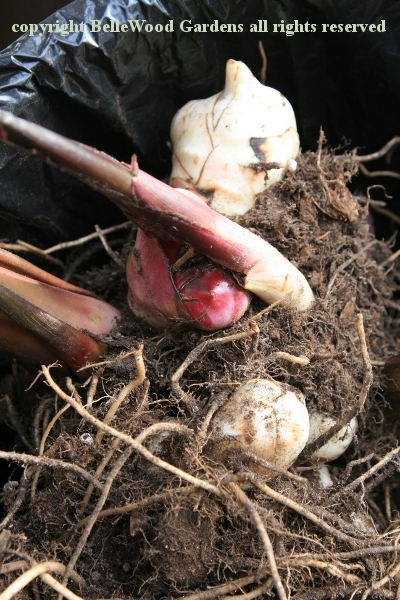 Dormant bulbs were potted on 29 June. 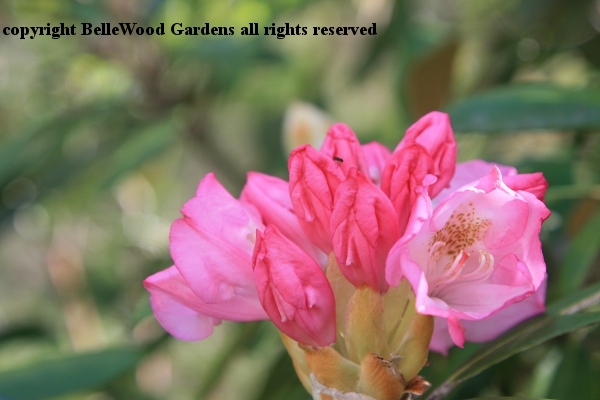 And in just 4 days they are in flower. I do like them. And so do honeybees. 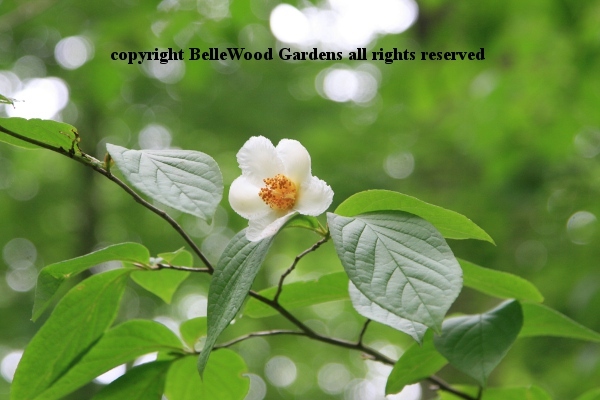 Summer brings Stewartia pseudocamellia with clean white flowers, but alas, no fragrance. 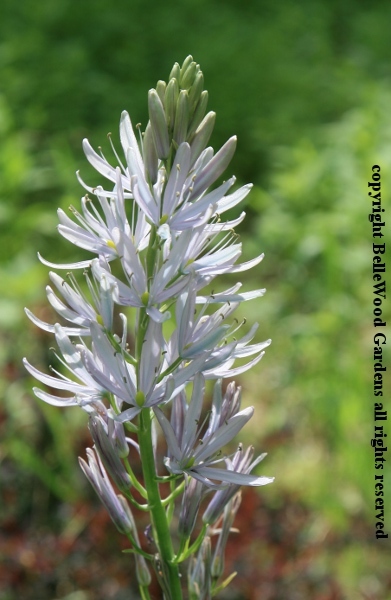 Night blooming and soon withering with morning sun. Mirabilis longiflora. 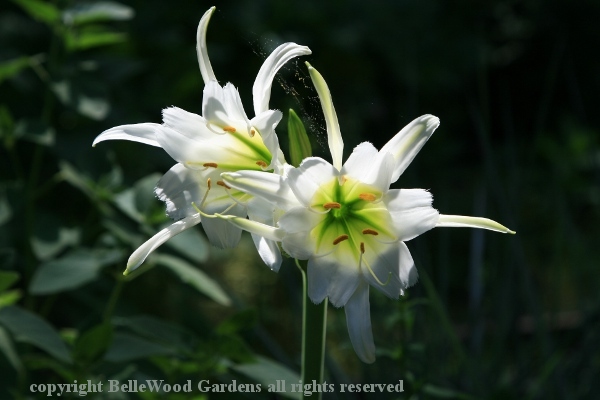 The name of this sizzling summer bulb, Hymenocallis, means "beautiful membrane." 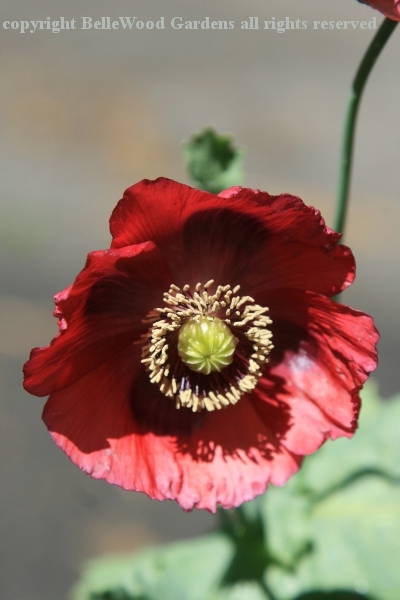 Call it what you will, Papaver somniferum is a beautiful annual poppy. 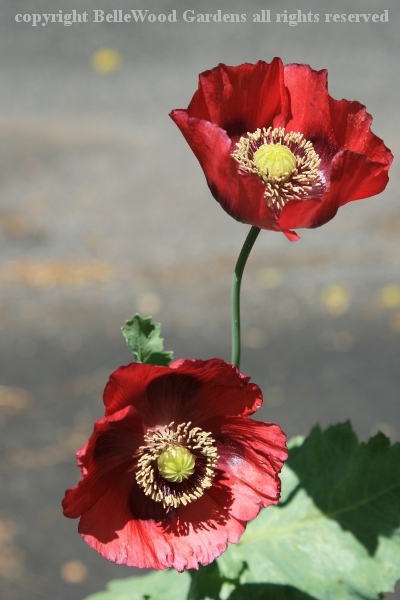 Common names include bread seed, lettuce leaf, and sleepytime poppy. 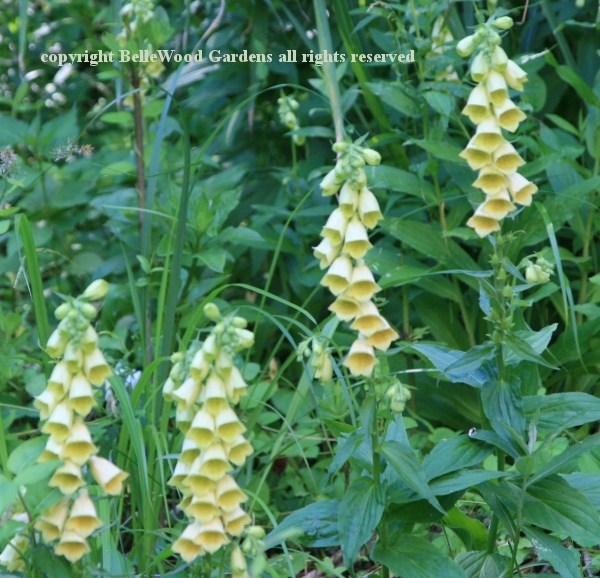 Yellow foxglove, Digitalis lutea, is a charming, self-sowing perennial. 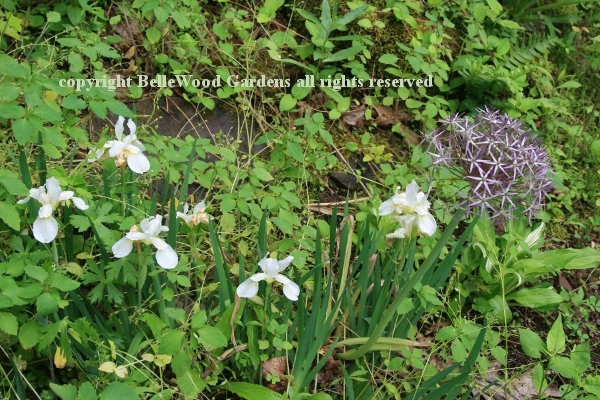 It is a welcome addition wherever it decides to plant itself in semi-shade. 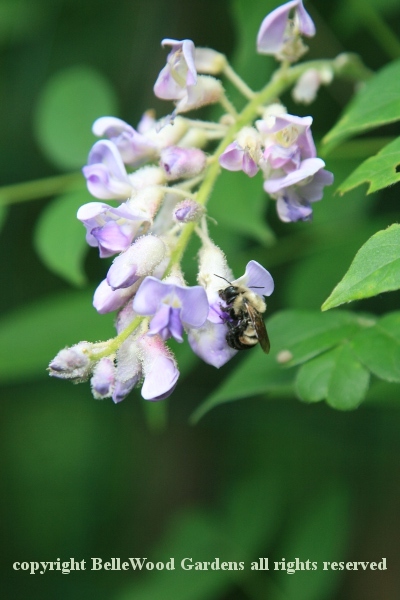 Turns out bees also enjoy our native wisteria, Wisteria frutescens. 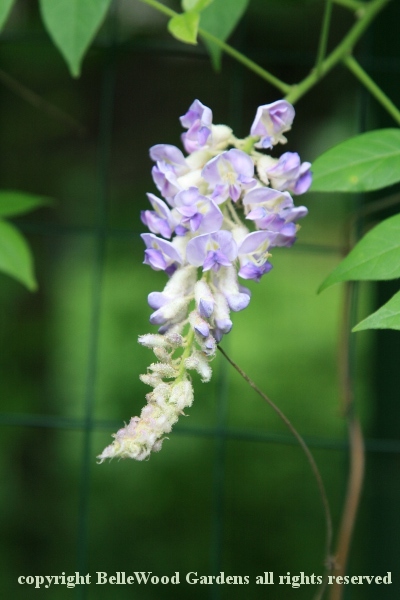 to the more commonly grown Asian wisteria. 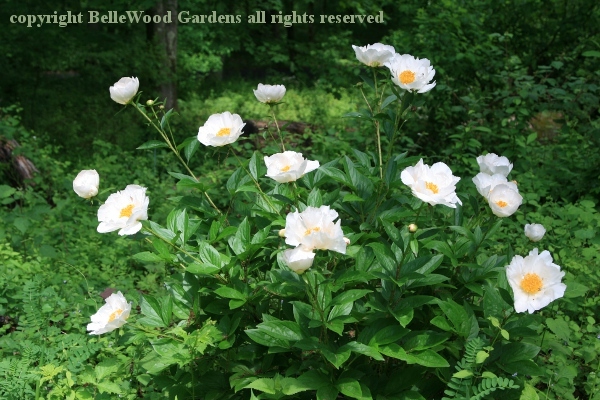 Just as lovely, and not as rampant. 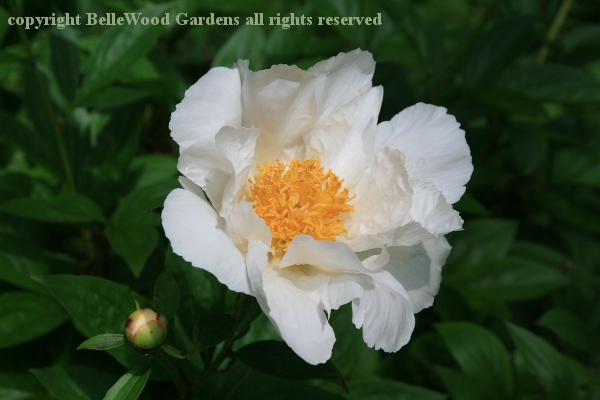 After the rain this double peony cannot hold up its flowers. 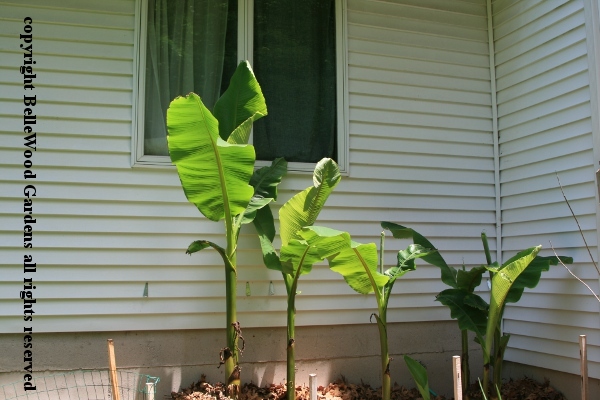 The hardy bananas are clearly loving the 90 degree Fahrenheit weather. 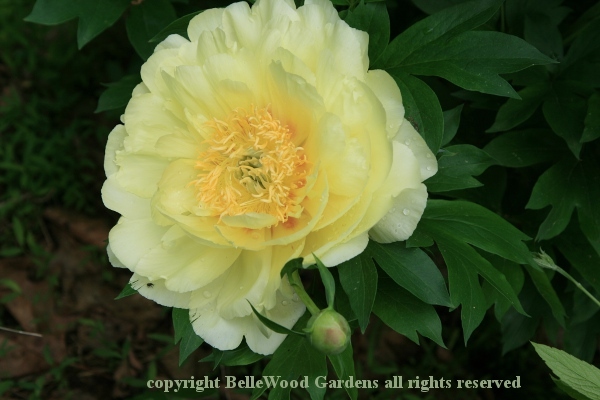 The intersectional yellow peonies are magnificent this year. Lipstick red. 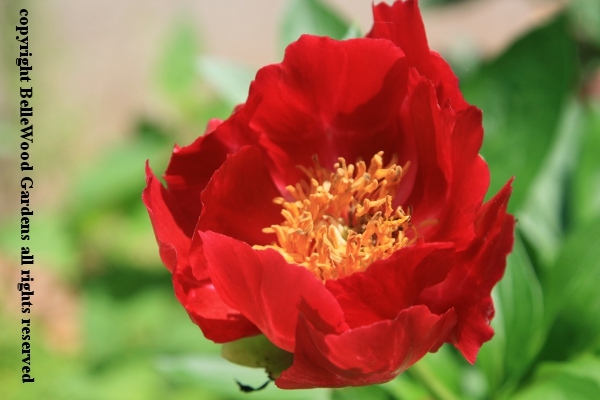 What other name would you give to this red peony. 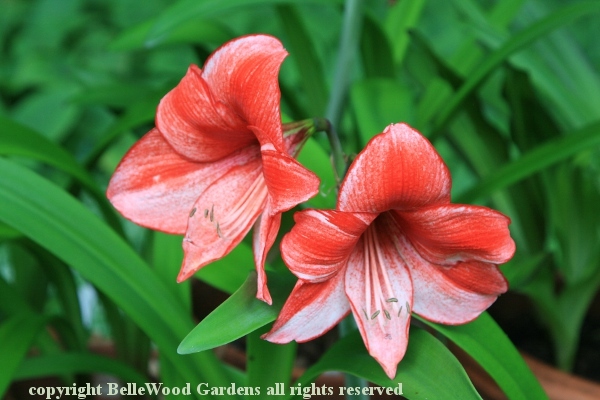 to go with its handsome flowers. 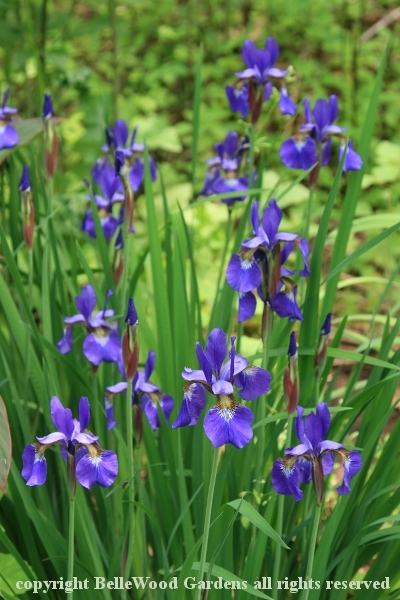 I got this clump of Siberian iris from a friend. Odds are it is the old favorite 'Caesar's Brother'. 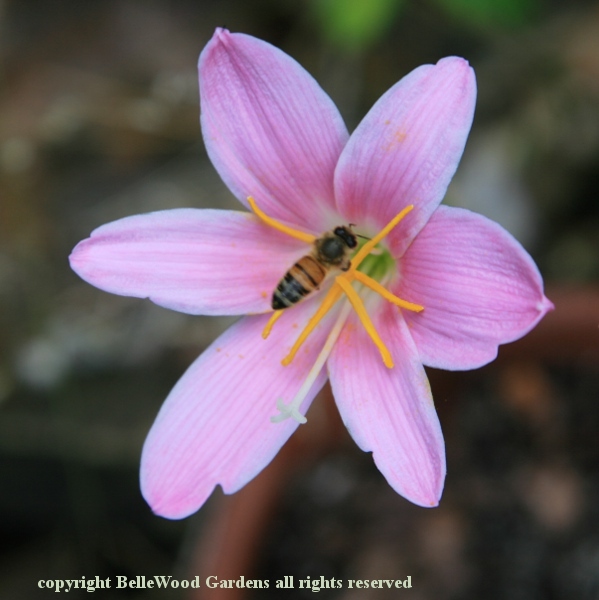 bee guide markings to direct pollinating insects. 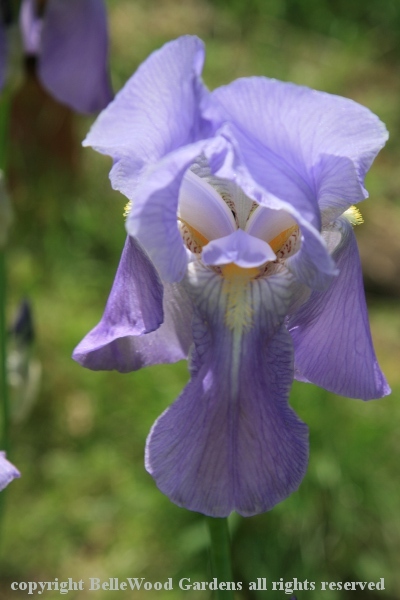 No idea of the cultivar, but this blue bearded iris has sweetly fragrant flowers. directing the insects to pollen and nectar. one that Sacagawea gave to Lewis and Clark and their men on their westward journey. 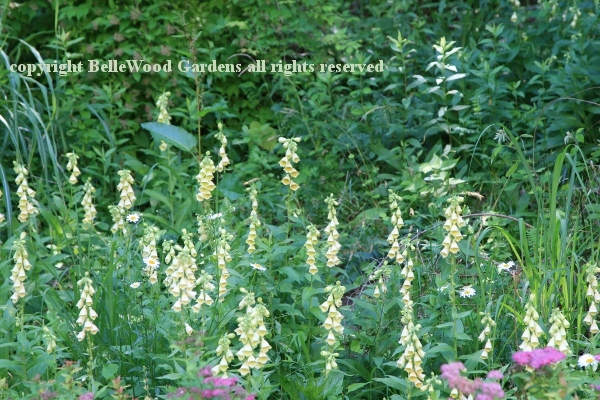 no leopards here at BelleWood Gardens. 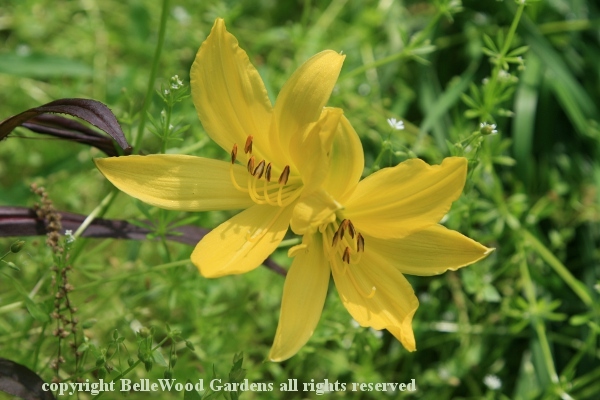 Lemon lily, Hemerocallis lileo-asphodelus, is the earliest daylily to flower for me. 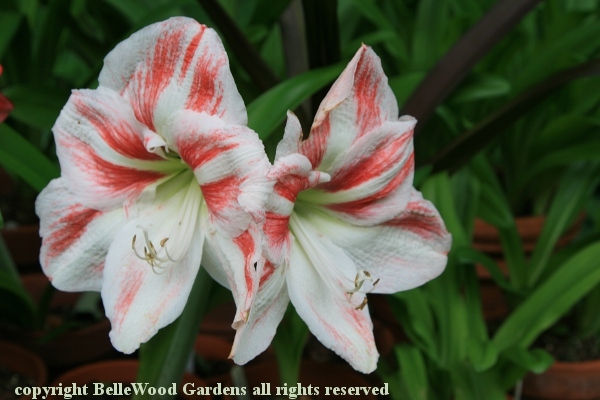 It too came from Connecticut, originally dug from the roadside by an abandoned house. 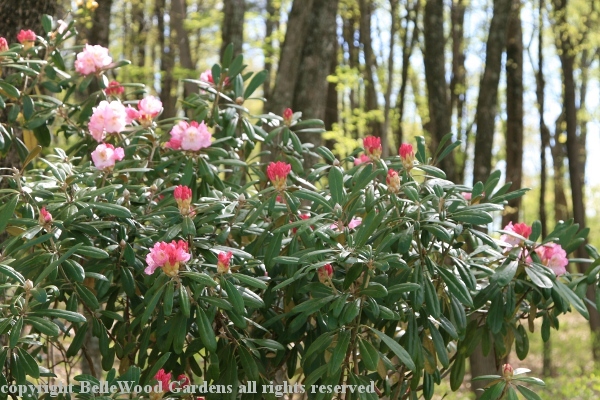 When we moved to New Jersey a respectable number of years ago one of the first wardrobe cartons off the moving truck contained this Rhododendron yakusimanum. on the underside of the leaves, to be unpalatable. 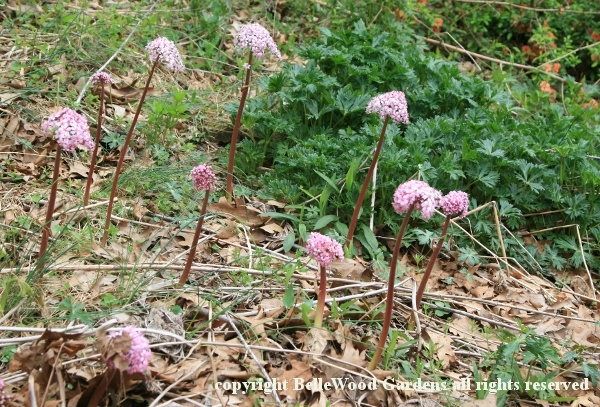 Umbrella plant, Darmera peltata, adaptable but happiest in damp soil. 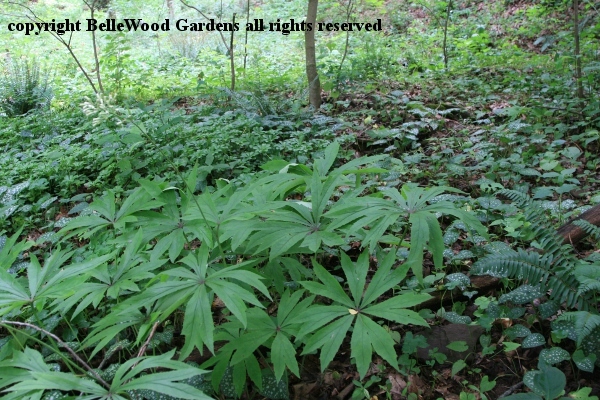 Sturdy stalks push up, quickly, before the leaves appear. 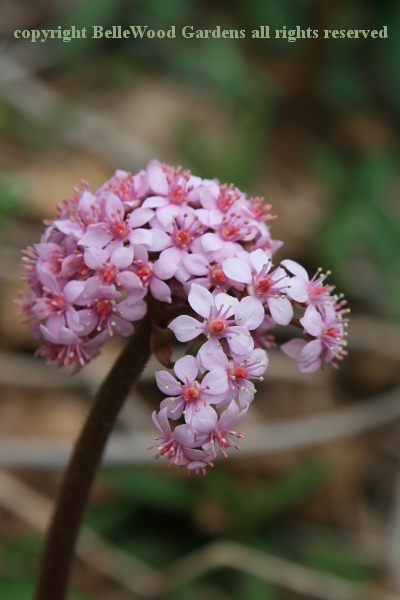 Fringed with stamens, the 5-petalled pink flowers make an appealing display. 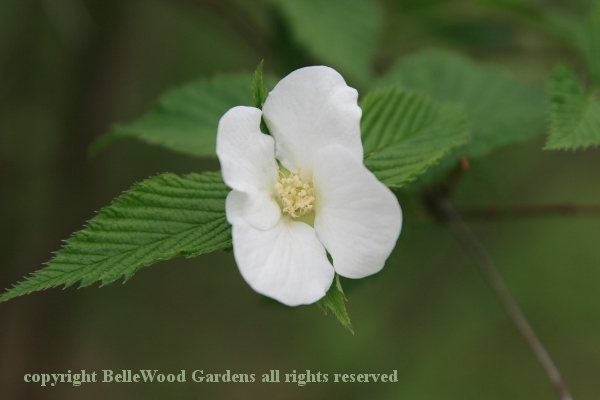 Jet bead, Rhodotypos scandens, is an easy-to-grow old fashioned shrub. 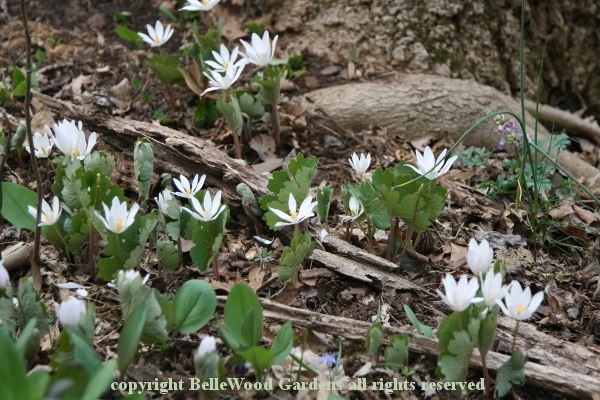 I like the pleated young leaves and pristine white flowers. 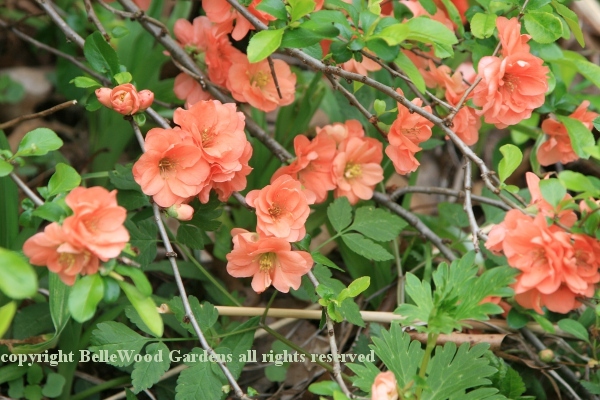 Flowering quince is most often seen with brick red flowers. Soft coral 'Cameo' is more pleasing to my eye . 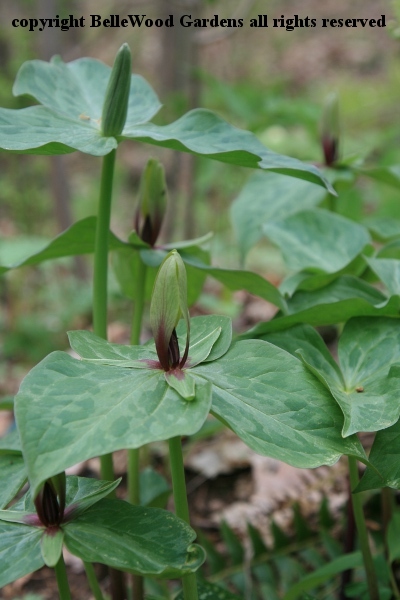 Typically, Trillium erectum has dull red-maroon flowers. As you'd expect, var. album is white. 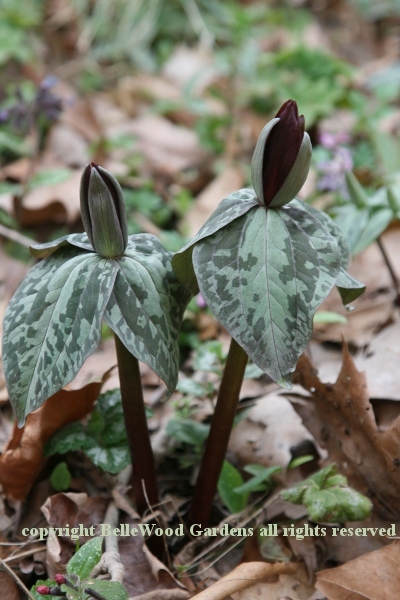 on the mottled leaves. 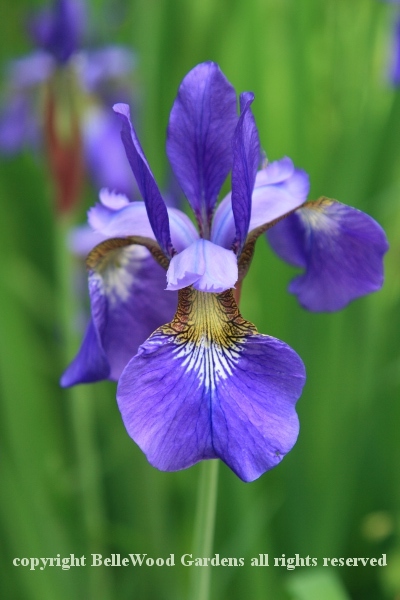 Its petals are narrow, claw-like, at that point. 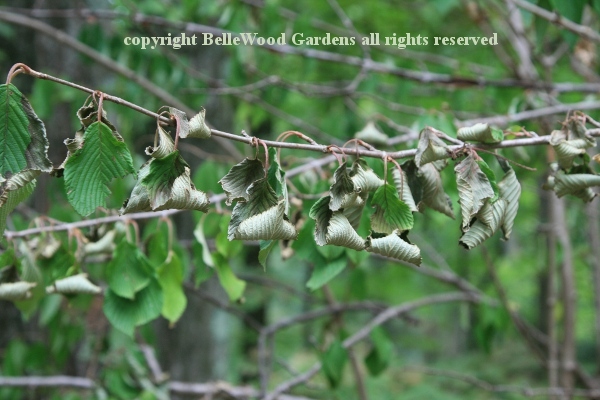 happily seeds about here at BelleWood Gardens. 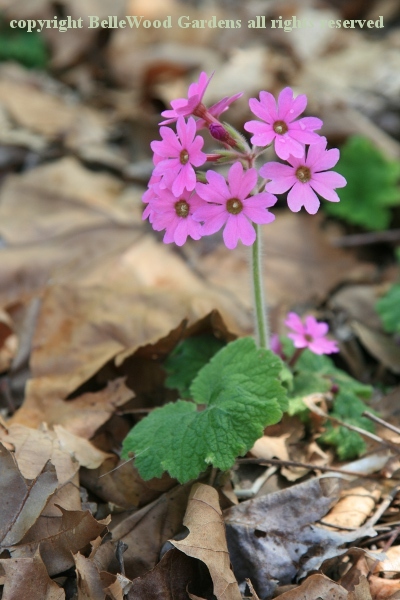 Native to Japan, Primula kisoana spreads with underground thread-like runners. 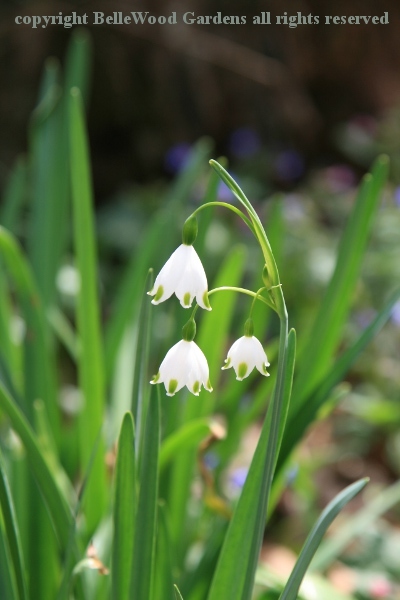 but it is later than spring snowflake, L. vernum (vernale, Spring) which flowers in February. 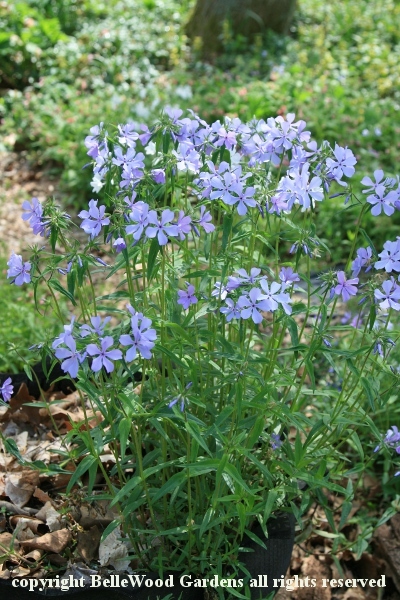 And by the way, there is even L. autumnale which flowers - did you guess? in autumn. 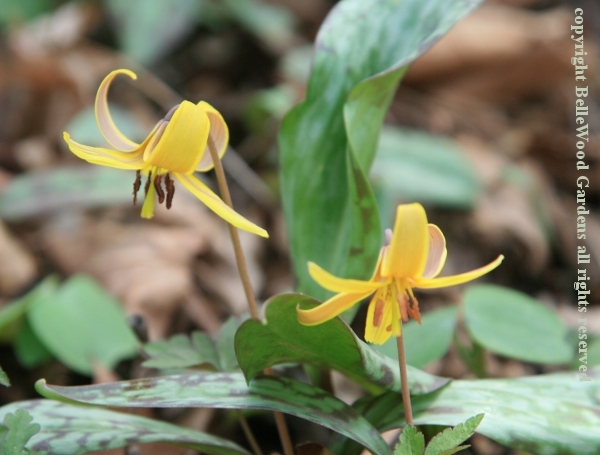 several common names for Erythronium americanum. Temperatures dropped to 24 degrees Fahrenheit on Tuesday night with this sad result. 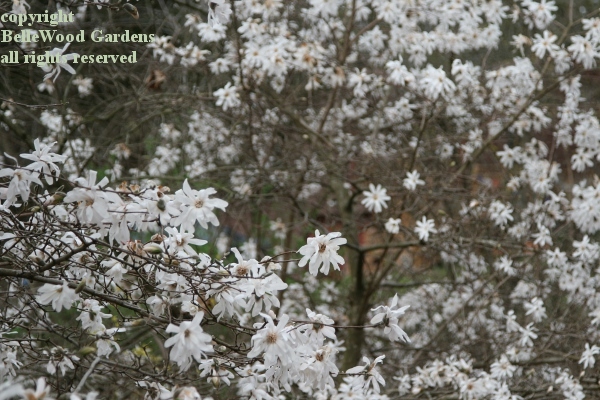 That low temperature is not exceptional but the preceeding high temperatures that coaxed the magnolias into early bloom were. 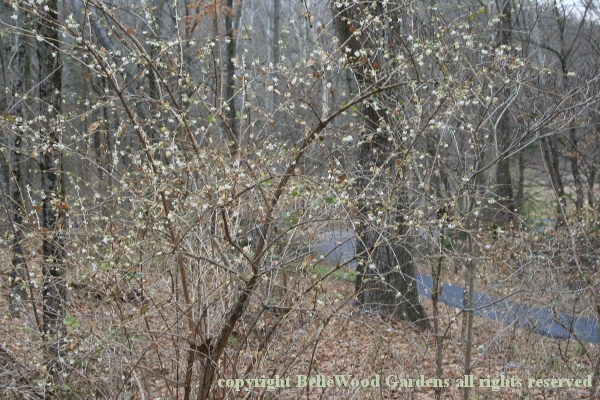 are in flower, a wonderful haze of white down in the woods. 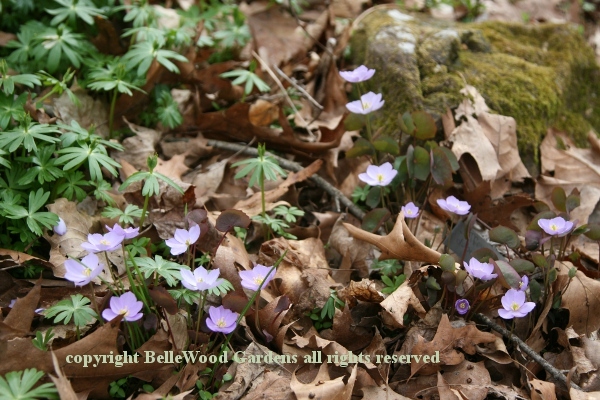 Jeffersonia dubia, the Manchurian relative of our native species. 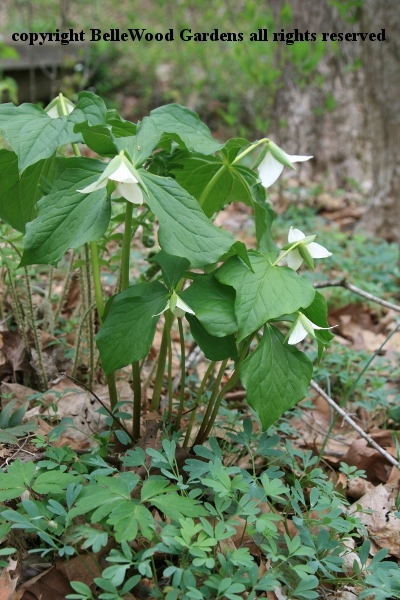 The earliest trillium here at BelleWood Gardens is Trillium cuneatum. 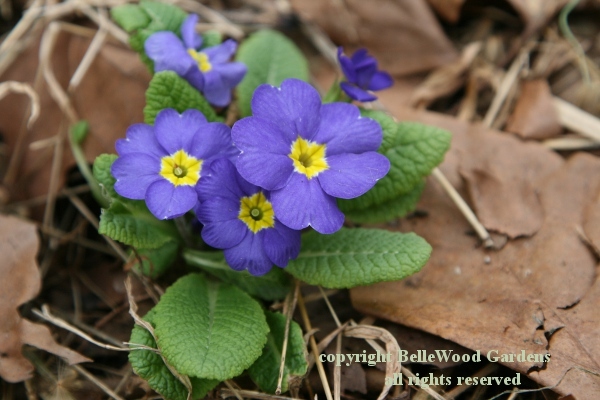 Supermarkets are selling primroses right now. 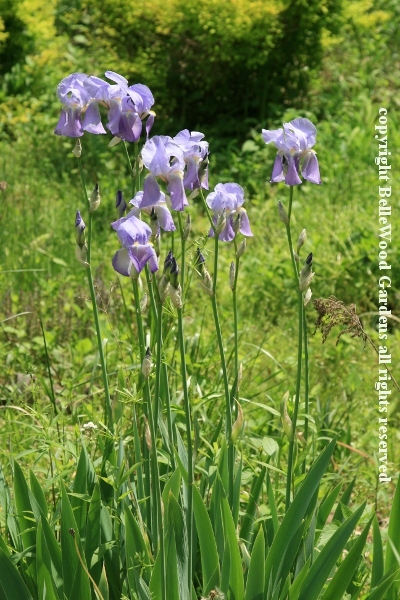 Probably Pacific Giant hybrids. Charming, with a caveat. Bred in the Pacific Northwest they don't always survive our winters. But sometimes they do. 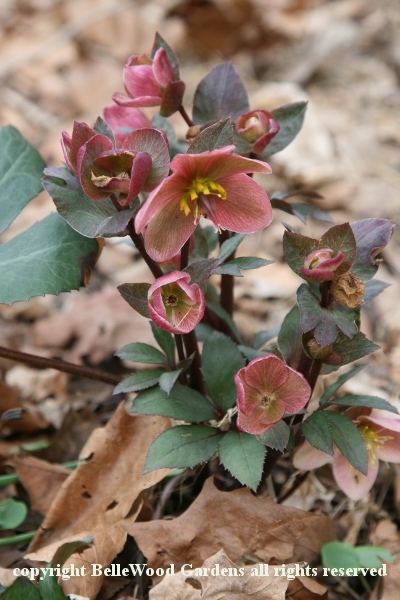 Another one of those supermarket hellebore hybrids. Love them. 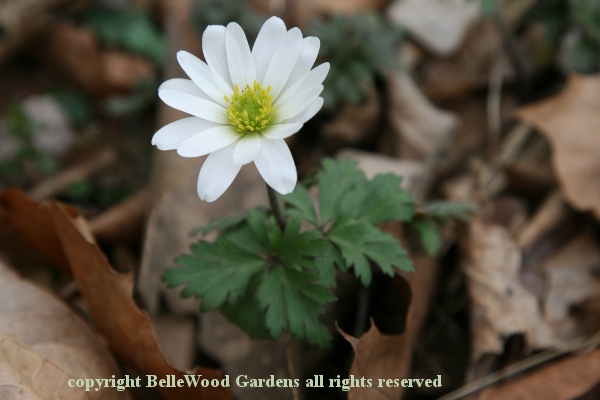 The daisy-like white flowers of Grecian windflower, Anemone blanda 'White Splendour'. Not a typo. It was named in England and that's how they spell it over there. 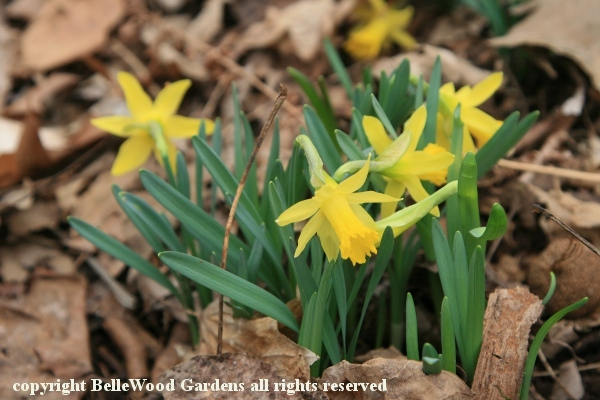 Narcissus 'Dove Wings' opens with a yellow trumpet that fades to ivory as it ages. 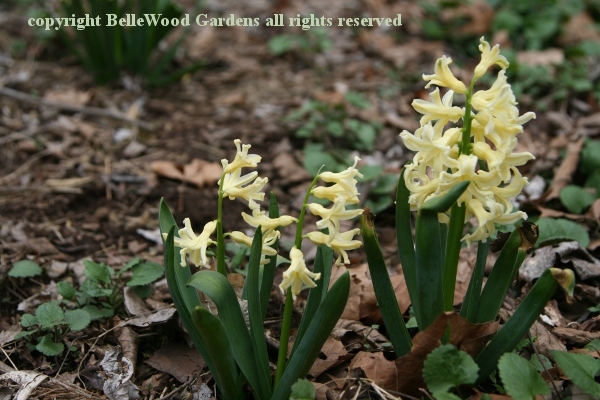 Sunny yellow hyacinths, sweetly fragrant. Not a dandelion. 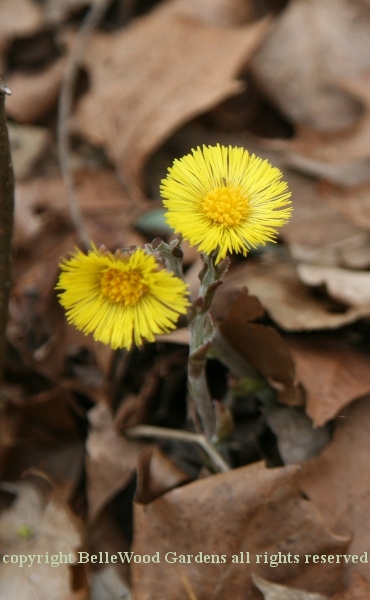 This is colt's foot, Tussilago farfara. 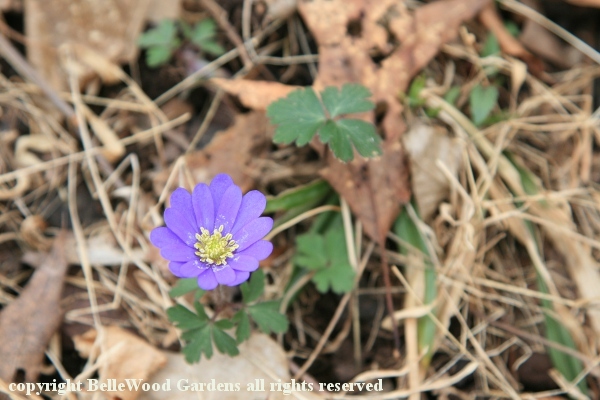 The little daisylike flowers of Grecian windflower, Anemone blanda, are popping up enthusiastically. 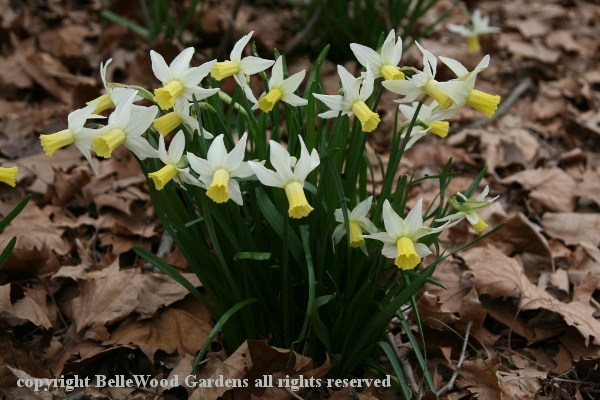 Wish I knew what this little narcissus is named. I keep thinking 'Mustard Seed' but I'm not sure that's right. 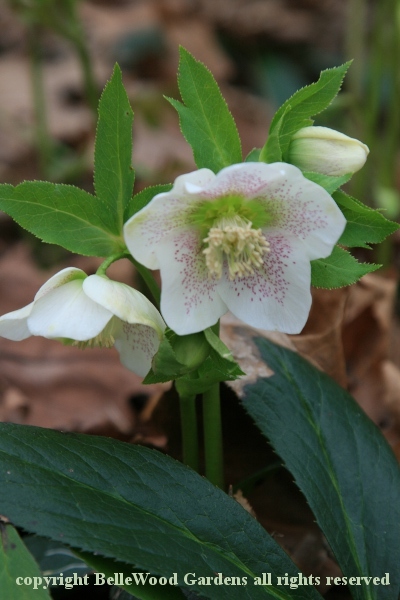 I'm rather happy with this Helleborus niger, flowering sometimes in early February, this year in March. 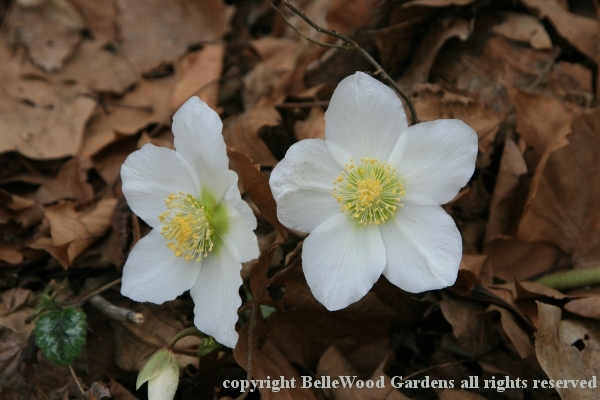 Over here the general run of the so-called "Christmas rose," do not bloom as early as that. Look for the 'Praecox' clone for that. Our winters are rather different than the UK version. 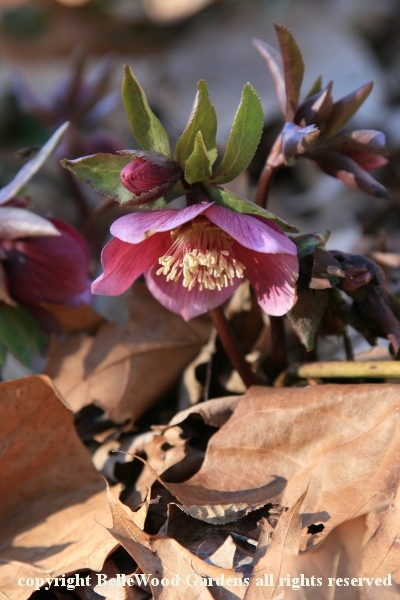 One of the self-sown hellebores at BelleWood Gardens, with a charming freckled face. 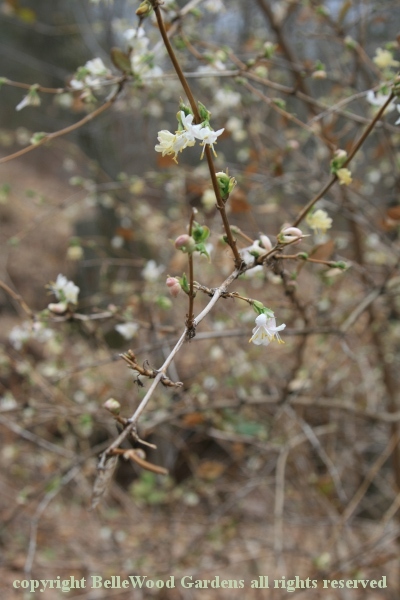 This early shrub may not be tremendously exciting to look at. Wish there was a way to photograph its fragrance. 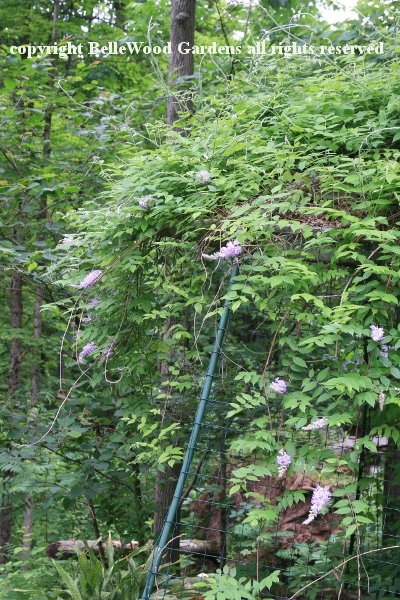 it does not run wild as do some other honeysuckles. 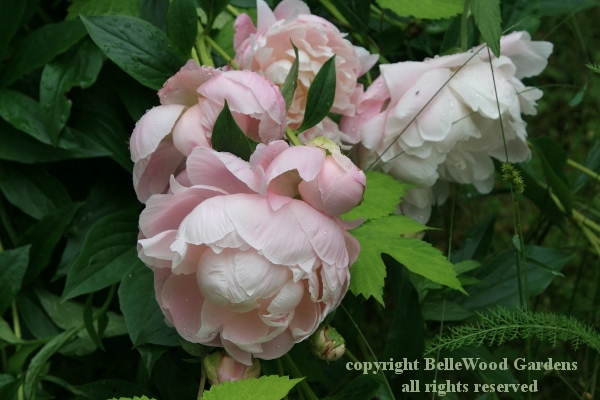 And did I mention its wonderful fragrance? 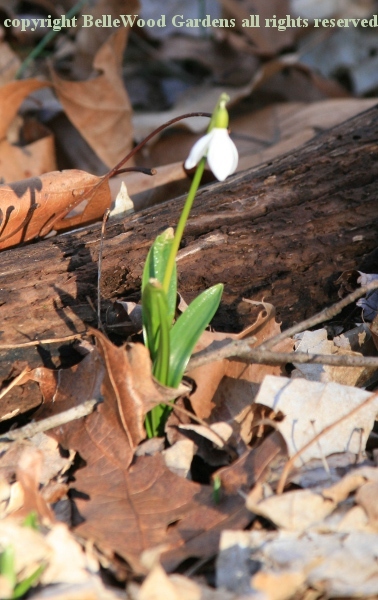 Another snowdrop, with fat petals like a cream tea spoon. Well, it IS still winter. One week, seven days. And what a difference it makes. 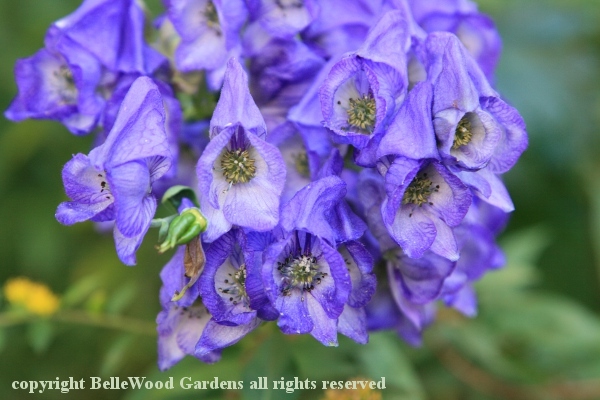 Helleborus Early Purple Group, rich petals and ivory stamens. 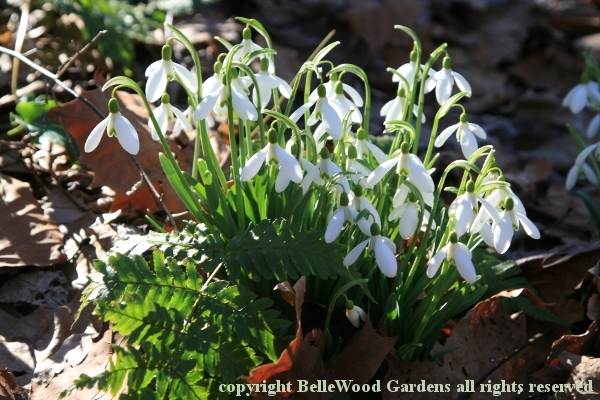 A well filled colony of snowdrops, Galanthus. 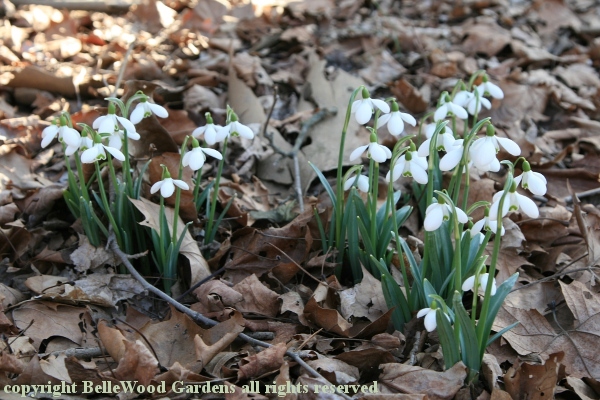 Galanthus woronowii with apple green leaves. 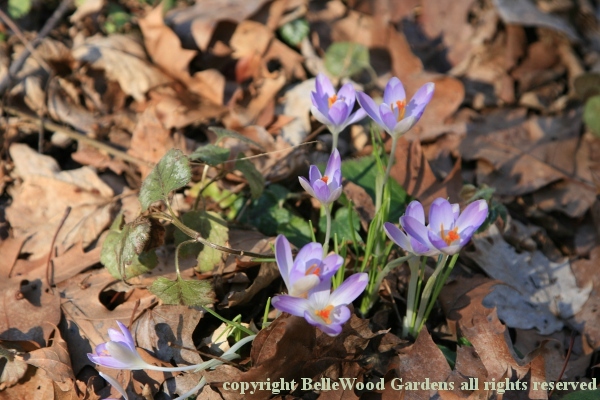 Crocus tommasinianus with flowers like a wisp of smoke. 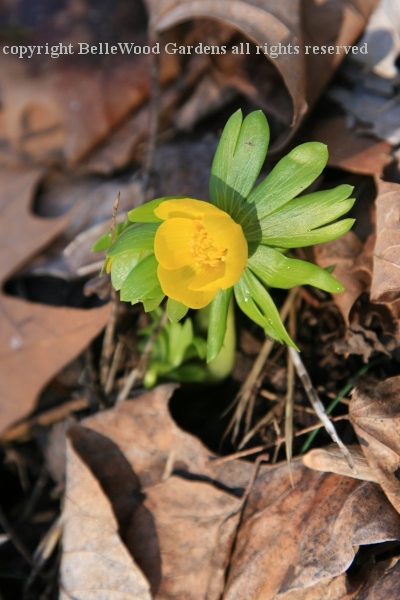 Eranthis hiemalis, more and more and more. Same location as the 22 February image just below. 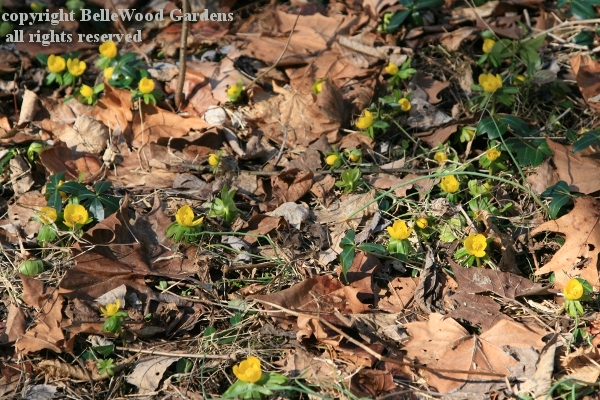 First flowers at winter's end, the golden petals of winter aconite, Eranthis hiemalis. 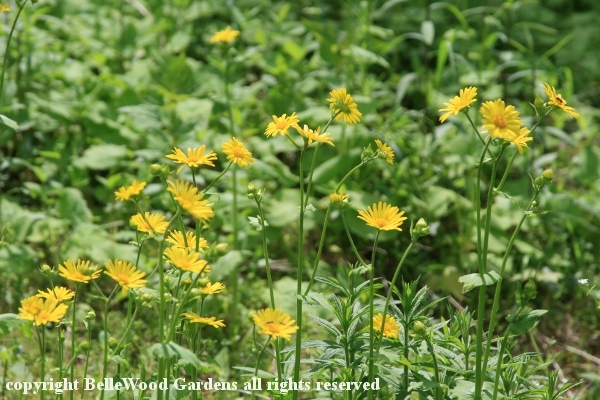 With a little green Toby ruff of foliage beneath a flower like a golden coin. 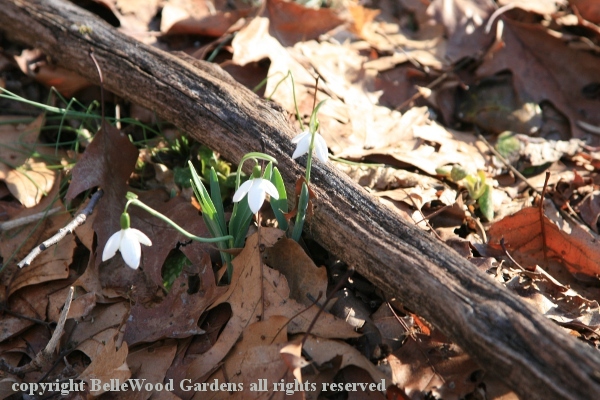 Snowdrop, Galanthus nivalis, delicate in appearance yet sturdy against cold. 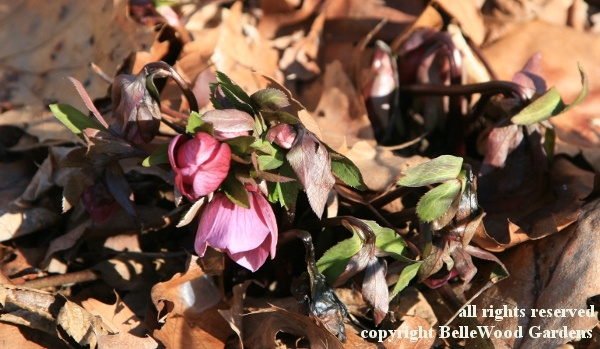 A favorite hellebore, Helleborus Early Purple Group almost ready to open.